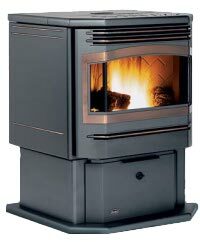 The Enviro Meridian pellet stove is designed in the American style, with a large bay window. For quiet running, the option is available to mount the combustion blower outside the home. This stove has a heavy duty heat exchanger and a cast iron brick effect firebox liner. Window Size 19in. by 8in. The Enviro Meridian has a good reputation for reliability. If you would like to leave a review of the Enviro Meridian pellet stove, please use the form on the contact page.